We encourage you to contact us with any questions or comments you may have. Please call our laser eye surgery Modesto / Stockton office or use the contact form below. Welcome, and thank you for visiting! Dr. Amin Ashrafzadeh's Stockton / Modesto LASIK surgery practice website is dedicated to patients seeking information about eye and eye diseases and professionals who want to learn more about advanced diagnostic evaluations and surgical treatments. We have made every effort to make this website as patient friendly as possible, yet there might be some pages that are far beyond the scope of their need. Dr. Ash is a consultant to Carl Zeiss Meditec on the ATLAS, Visante Anterior Segment OCT and the IOL Master. Many pages on this website are specifically made to teach professionals about these instruments. We hope this information will be helpful to you and generate a better understanding of your conditions. As always, the specifics of your health is best judged and managed by your doctor. This website in no way is able to substitute your doctor's opinion. If you’re a current Modesto / Stockton LASIK or cataracts patient, thank you for allowing us the opportunity to fulfill your eye care needs. If you’re a new visitor, we look forward to meeting you and exploring the various options available for correcting or enhancing your vision. We have a series of very advanced diagnostic equipment in the office that are used to for optimal care for our patients. 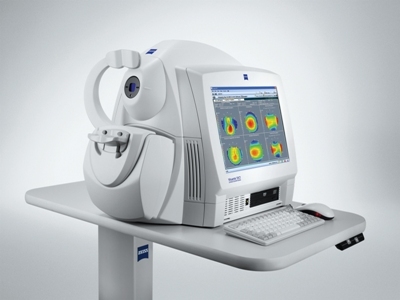 IOLMaster 500 is the most advanced equipment for the intraocular lens calculation. I have a number of pages written to help fellow ophthalmologist better use this equipment. Visante omni is one of the most sophisticated systems in the anterior segment imaging and evaluation of the cornea. I have many pages written on this instrument. Please feel free to browse. When you visit our office, your eye health is our top priority. Our entire Stockton / Modesto LASIK team is dedicated to providing you with the personalized care you deserve using only the latest, most innovative techniques in eye care. We offer a variety of refractive surgery and general ophthalmology treatments to help restore and maintain your optimal vision health. Dr. Ash is dedicated to providing all of his Modesto / Stockton LASIK eye surgery patients with the highest level of care. In addition, Dr. Amin Ashrafzadeh specializes in cataract surgery and offers several sophisticated treatments for cataracts Modesto / Stockton patients. All contents including the images are copyright protected by Amin Ashrafzadeh, MD who provides this on-line information for educational and communication purposes only and it should not be construed as personal medical advice. Information published on this website is not intended to replace, supplant, or augment a consultation with an eye care professional regarding the viewer/user's own medical care. Amin Ashrafzadeh, MD disclaims any and all liability for injury or other damages that could result from use of the information obtained from this site.